An Emirates airline flight from India has crash-landed at Dubai International Airport with some 300 people on board, officials say. Images posted online show thick black smoke coming from the plane, with no landing gear visible. The Dubai government media office said all passengers were evacuated safely and no injuries have been reported. It said all departures and arrivals from the airport have been suspended until further notice. The Boeing 777 was reportedly flying in from the southern Indian city of Trivandrum. 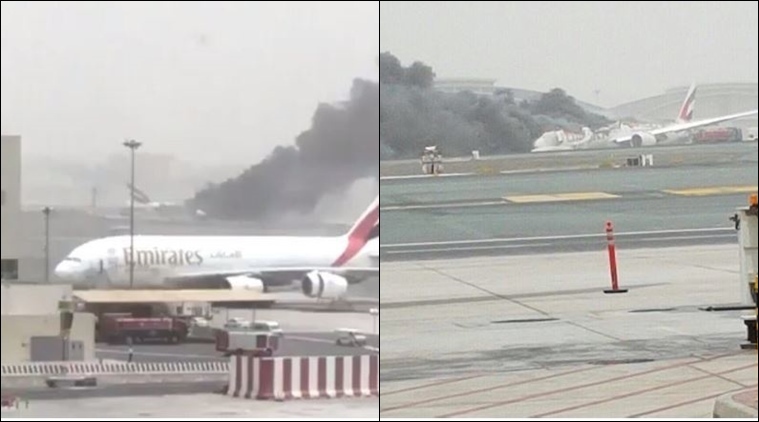 Emirates airline said there were 282 passengers and 18 crew on board. “Our main priority now is the safety and well-being of all involved,” the airline said on Twitter. Passengers on planes landing at the airport at the time looked on in horror. “I couldn’t believe my eyes. I was absolutely horrified,”, Sarah-Louise Sherwood told the BBC. “The slides came out but they were blowing all over the place. People managed to escape – from what I saw – before there was a big explosion, with flames everywhere. We had taxied and stopped right next to where it was happening and people in my plane were just saying ‘oh my god’ and ‘get us off this plane’,” she said. No cause has so far been established for the crash, but images shared on social media suggest a belly landing, which occurs when an aircraft lands without its landing gear fully extended, using its underside to come to a halt. Dubai authorities emergency services were dealing with the situation, and plan to give an update shortly. The live air traffic monitor Flightradar24 posted more details of the aircraft involved in the incident. Emirates is the Middle East’s biggest airline, and has an excellent safety record. It ranked seventh in a survey of the world’s safest airlines by AirlineRatings.com, an independent plane safety website. Dubai International Airport is a major transport hub, one of the world’s busiest for international passengers, operating with only two runways. Photos and videos of the aircraft were posted to social media, showing the plane lying on the runway with thick black smoke pouring from its fuselage. One video showed the plane slowly grinding to a halt on the tarmac as smoke began to rise, with its right engine dragging behind the wing.